The revolutionary Predator Inspection System's cutting edge portable x-ray technology makes it possible for pest management professionals (PMPs) to actually see inside walls in search of termite infestations. Combining state-of-the-art x-ray and digital film processing equipment, the Predator is the perfect tool for finding termite damage and active infestations. 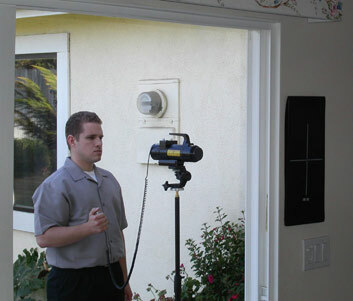 Using the Predator, PMPs can now pinpoint the location of active termite infestations within a home or other structure. Once located, the infestation can be controlled using a non-repellant termiticide that is injected directly into the structure, killing the termites quickly, and without fumigating. Every component of the Predator Inspection System utilizes the latest technology to detect termite infestations. The Predator Inspection System comes fully equipped with the specially calibrated x-ray camera, tripod, acoustic emission device, film processing unit, two 8x17" film plates, and a laptop computer with custom imaging software. The Predator x-ray camera utilizes an x-ray source capable of penetrating a 1/2" steel pipe, and has been specially adapted for use in termite detection. Weighing only 4.5 pounds and battery-operated, the Predator camera is extremely portable and easy to use. The x-ray source is lead-shielded for safety, and uses completely re-useable film plates that erase in light after development. Exposed film plates are developed in the Predator film processing unit, which uses laser technology to create a digital picture within 3 1/2 minutes. Each digital image is stored on the Predator laptop where it can be analyzed for the presence of termites. Once termite evidence has been revealed by the Predator x-ray, the included Acoustic Emission Device (AED) is used to show whether the termites are alive or dead. The AED is a handheld probe that listens for the exact frequency of termites gnashing their teeth together. When the AED signals the existence of live termites, a termiticide can be locally applied to the location, and the termite infestation can be controlled. 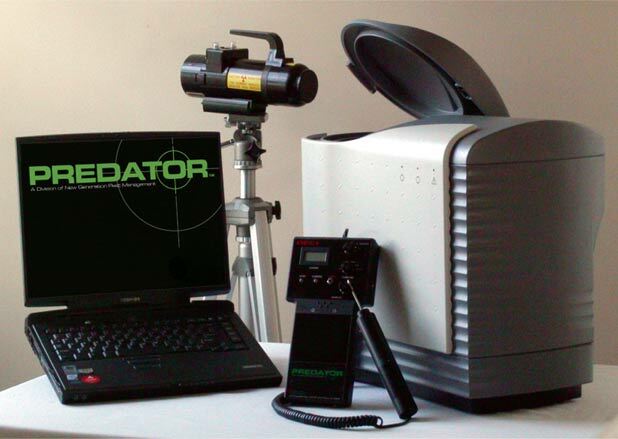 How do you integrate the Predator Inspection System into your pest management business? The Predator Inspection System is intended to be used as a termite treatment alternative to fumigation. Combined with a non-repellant termiticide, termite infestations can be located and treated without fumigating the entire structure. Perform a standard termite inspection and note termite evidence if applicable. If termite evidence was found in step 1, recommend using the Predator Inspection System to further inspect the noted infestation areas and locally treat the active infestation. On site, use the Predator to determine if the detected infestation is alive. X-ray the bottom plate of suspected areas for evidence of termite pellets kicked-out from the termite galleries. The Predator's highly sensitive Acoustic Emission Device is used to confirm the status of the infestation: either a live infestation or dead termites from a prior treatment. Once a live infestation is confirmed, the Predator x-ray camera is used to determine the extent of the termite damage and a termiticide can be applied to eliminate infestations. After treatment, the customer is billed for a fee comparable to a fumigation service, and the entire structure is guaranteed to be termite-free for the same term as a fumigation. Retreatments within this warranty term are provided free of charge, but cost your business little more than 1-2 hours worth of labor. How Safe is the Predator? The Predator Inspection System is easy and safe to operate. Hands-on individualized safety and operation training and certification are provided by New Generation Pest Management with each unit purchased. Your operator/technician will be trained to safely and effectively operate the Predator Inspection System to detect and treat termites. X-ray equipment must be used with care and each operator/technician must be certified in order to operate the Predator. New Generation Pest Management Inc. is committed to providing every customer with complete and extensive training to insure safe effective utilization of the Predator Inspection System. With each Predator Inspection System purchase, NGPM comes to you and conducts in depth instruction with your technician(s), teaching the skills required to proficiently operate the Predator Inspection System. As part of onsite training, your technician will be instructed in the safe and legal use of the system according to the regulations for your specific region. Additional on-going training services above and beyond NGPM's standard onsite training are available contact NGPM Customer Service to discuss your company's unique needs and requirements.